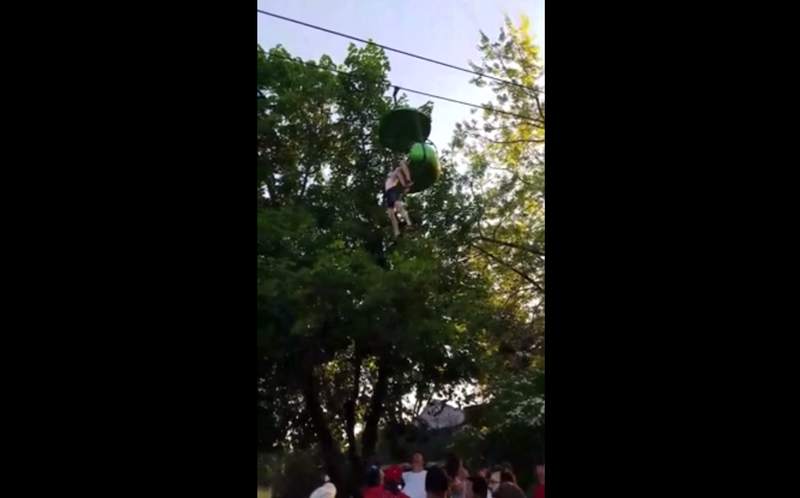 Six Flags witness says girl's fall from ride was "horrifying"
QUEENSBURY, N.Y. -- A teenager fell about 25 feet from a stopped gondola ride at an upstate New York amusement park Saturday night, tumbling into a crowd of park guests and employees gathered below to catch her before she hit the ground. The unidentified 14-year-old girl from Greenwood, Delaware, was taken to Albany Medical Center in stable condition with no serious injuries, the Warren County Sheriff's Office said. The accident happened on the "Sky Ride" at Six Flags Amusement Park, about 55 miles north of Albany, New York. The sheriff's office said in a statement that the girl was riding the attraction with a child relative, and fell from a stationary two-person car. The ride was stopped by an operator after getting word of a rider in distress, officials said. Witness Loren Lent told CBS Albany affiliate WRGB-TV that people scrambled to get beneath the girl. "It was horrifying. I mean, you know, you could tell this person is helpless," Lent told the station. "... I said to one of the staffers, I said, 'You guys mean to tell me you don't have anything set up to rescue somebody in this situation?' and he then told me to leave the scene." Authorities say the girl fell from the car and struck a tree before landing in the crowd. She was treated by park emergency medical staff and taken by ambulance to Glen Falls Hospital before being transferred by helicopter to the medical center. Officials inspected the ride and said it was in proper working order. The park said in a statement that the safety of guests is a top priority. "There does not appear to be any malfunction of the ride, but we have closed the attraction until a thorough review can be completed," a park official said. Authorities also said an unidentified 47-year-old man from Schenectady, New York, who was a guest at the park, was treated and released from a hospital for a back injury sustained when he attempted to catch the falling girl.